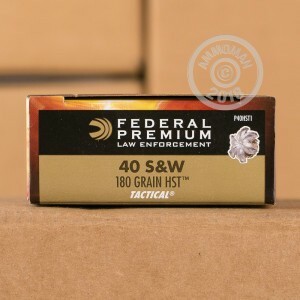 HST is Federal's top self-defense offering. Originally developed in 2002 for police use, it became available to the public in 2013 and has quickly established a following among concealed carry licensees for the same reasons it is popular among LEOs. HST hollow points feature a skived tip designed to generate deadly 6-petal expansion to bring down assailants quickly and decisively. 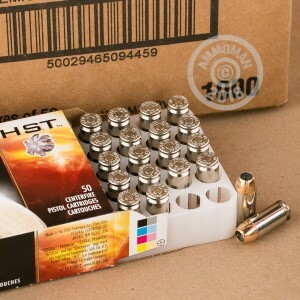 This .40 S&W version of the HST load fires a heavier 180 grain projectile at just over 1,010 feet per second. 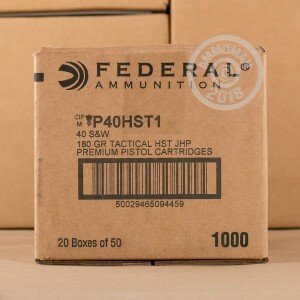 Like other Federal defensive ammo, these cartridges are loaded in Anoka, Minnesota using non-corrosive Boxer primers and nickel-plated brass cases. Each box contains 50 cartridges.